Save those old family pictures by professionally restoring them. Make a creative collage to showcase your favorite moments. Spruce up those boring envelopes with cute and custom address labels. Make your business cards stand out from the competition with a style all your own. Give photo calendars as gifts so your loved ones see you every day of the year. 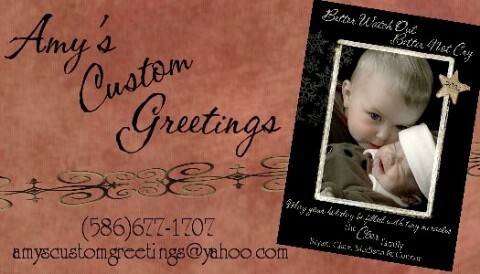 Amy’s Custom Greetings can help fill all your custom photo needs! Amy created my christmas cards this past season and everyone loved them! They were so cute and perfect for our kids. Creation and delivery were faster than I would have ever expected. Thanks for a wonderful product!